How in shape you are is a result of your habits. How educated you are is a result of your habits. How happy you are is a result of your habits. How much money you have is a result of your habits. How good your relationships are is a result of your habits. So, if you want to lead a successful life, it’s crucial that you learn how to master your habits. Here’s how. A cue — The trigger that starts your habit. Example: You get an email notification. 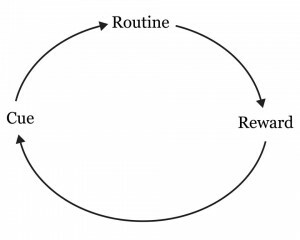 A routine — The habit that follows the cue. Example: You open the email. A reward — The benefit you gain from doing the habit. Example: You get to know what the email is about. If you perceive the reward as positive, you’ll want to repeat the loop again the next time the cue shows up. If you repeat it enough times, it will become a habit. The habit loop is a very useful framework because it makes it easy to dismantle your habits and manipulate its different parts. Let’s go through each of the habit loop parts and look at the most powerful strategies for mastering them. Most people have very vague intentions for the habits they want to create. Unfortunately, as you may have noticed, telling yourself that ”I’ll work out three times this week” rarely works. And that’s because you haven’t created a proper cue for the behavior. If [situational cue], Then I will [planned response to the cue]. Don’t be fooled by the simplicity of this strategy. More than 200 studies have shown that people who use If —> Then planning are about 300 percent more likely than others to reach their goals3. When we create new habits, we tend to want big results fast. And because of that, we try to create big changes. The problem, of course, is that it rarely works. Instead, what typically happens is that we overwhelm ourselves and quit shortly after we’ve started. To avoid that trap, you need to make a simple shift in your mindset. Instead of obsessing over the results, start obsessing over showing up. Forget about the long-term results, and instead make the habit so ridiculously easy you can’t say no4. Go for a five-minute walk. Meditate for two minutes. Read one page in a book. Build motivation and momentum by setting yourself up for, and celebrating, small wins. Then, when the behavior is well established, you can incrementally increase your efforts. To reinforce your habit, you need to reward yourself for doing it. That can feel a bit awkward, especially in the beginning when the behavior is easy to do. But the thing is, you aren’t celebrating your results. You’re celebrating your ability to show up. Don’t celebrate your five-minute walk. Celebrate that you’ve taken another successful step to improve your life. Allow yourself to do a quick fist-pump, short victory dance, or exclaim a proud ”yay, me!” each time you complete your habit. The Habit Loop isn’t just helpful for creating good habits. It’s also very useful for getting rid of unwanted behaviors. All you have to do is analyze and manipulate the different parts of the already existing loop. Here’s how. If you smoke when you drink, don’t go to the bar. If you eat unhealthy snacks when you have them around the house, throw them out. If you watch too much TV, put the TV remote in another room (or put the TV in the garage). If I get the urge to smoke –> Then I will play Tetris. If I feel like eating a snack –> Then I will have a fruit. If I want to turn on the TV –> Then I will read two pages in a great book. The key here is to experiment with different routines to find substitutes that work for you. And finally, come up with creative ways to remove the rewards associated with your bad habit. Let’s say you want to stop drinking alcohol. One way of removing the rewards associated with drinking is to take Antabuse7. That will replace the pleasant short-term effects of alcohol with a reaction that is so unpleasant that you’d rather abstain from drinking. You can also use services like StickK, Beeminder or Pact to create immediate consequences for giving into your bad habit.